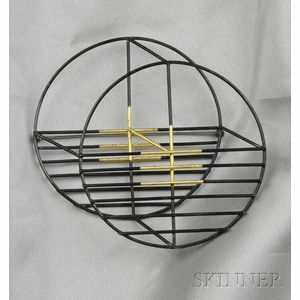 Modernist Brooch, Joe Wood, the three-dimensional form of blackened metal wire with gold leaf accents, lg. 3 3/8 in. Note: From the Estate of Margret Craver Withers (1907-2010). 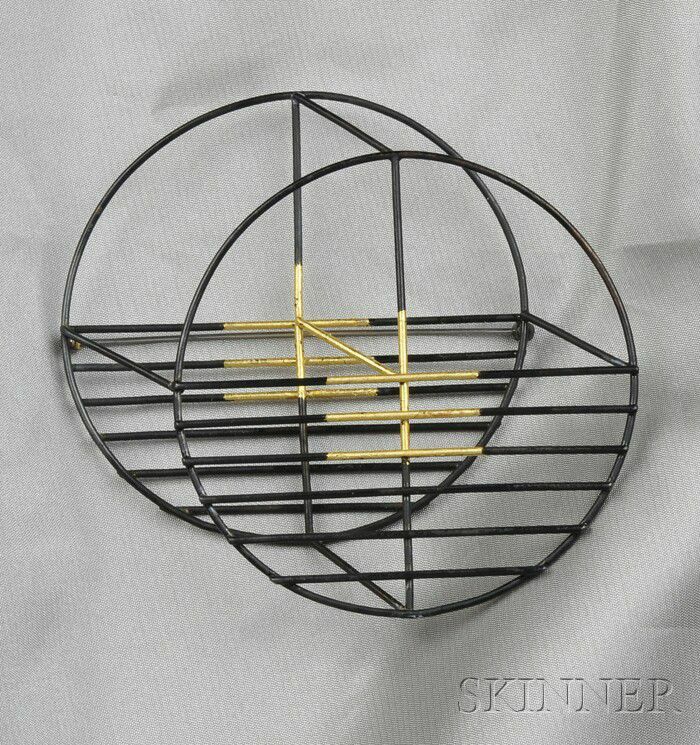 Margret Craver had numerous accomplishments as a modernist jeweler and metalsmith. She was largely self taught. Craver was born in Pratt, Kansas, and introduced to metalsmithing as a design major at the University of Kansas in the late 1920s. In 1938 she traveled to Sweden to study with Baron Erik Fleming, silversmith to the King. Under his tutelage, Craver refined her craft and sharpened her skills. Silver was her medium of choice, but she also worked in enamel and gemstones. During the war Craver taught metalwork to veterans as a means of therapy at Walter Reed Army Hospital. From there, she was appointed Director, Craft Service Department, at Handy and Harman. Craver cut her own gemstones (lot 460) and rediscovered the lost technique of en resille enameling. Her numerous awards include two from the Philadelphia Art Alliance: First Award in 1938, and Certificate of Merit in 1940 for a bonbonière now at the Art Institute of Chicago; Medal of Honor, Wichita Art Association, 1949 (lot 437); "Woman of the Month" by the American Women's Association, 1949; Honorary Member of the Master Gold and Silversmiths Guild of Sweden, 1950; Gold Medal for Excellence, American Craft Council, 1986; and in 1989, a year after her retirement from metalsmithing, Craver was honored for "Outstanding Achievement in the Visual Arts" by the Women's Caucus for Art. Her work is in numerous museum collections including the Museum of Fine Arts, Boston, the Metropolitan Museum of Art, New York, the Art Institute of Chicago, the Renwick Gallery, Smithsonian Institution, and the Victoria and Albert Museum in London. Skinner is very pleased to offer selections from Margret Craver's estate that range from the work of others that she collected, such as fellow innovator John Paul Miller (lots 427-429), to Craver's own unique Solar-Lunar Cosmos series (lots 441-451). Very minor loss to gold leaf, otherwise without issues.